It's officially June and you know what that means! E3 is just weeks away and as usual, we will be on the ground in Los Angeles to cover the event and share our experiences with you all week long! As gamers, we all have reason to be excited for the show this year. With VR trying to find it's place in the world and the abundance of competition between the major players and the 3rd-party companies, there is undoubtedly going to be a LOT to be excited for over the course of the next year(s). But on top of that, the entire Podcast crew will be in attendance together for the first time in years! To celebrate, we will be mixing things up a bit and making some changes to the way we bring content to you throughout the week and the weeks that follow. 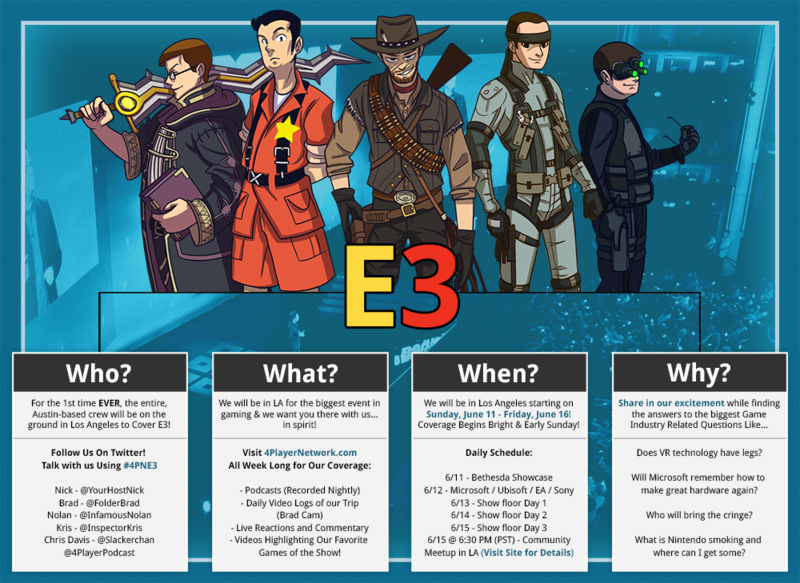 As you probably already know, E3 is a BIG event to cover for a group of our size with the resources we have at our disposal. The plan we've outlined below should allow us to get the most out of the event while it's happening while bringing you guys at home an abundance of content to enjoy! Our coverage will span everything from Discord and Social Media to Podcasts and Video Content. We hope you guys will join us for a fun and exciting week! Your interaction with us throughout the trip will help make this our best E3 yet! We leave Austin at the crack of dawn on Sunday, June 11th and will be in Los Angeles until Friday, June 16th! Expect the cameras to start rolling as soon as we hit the road. Nightly Podcast Recordings - Starting Sunday, Join us every night as we sit down to recount the experiences from the day and talk about all the big announcements and games featured at the show. The start times each night might vary so keep your eyes on the calendar and our social media accounts for live updates. If you miss the live recordings, we will have the episodes uploaded and available to download the following morning! - It would be a good idea to subscribe to our show if you haven't already! Daily Video Logs ("Brad / Krispy Cam") - Over the years, our community has come to affectionately call this footage “Brad Cam". This year, Brad and Krispy will both be busting out handy cams to capture the entire trip. If you haven't seen it before, I can assure you this will be the rawest look at E3 you will ever get. At the end of each day, we will splice the footage together and release it as a sort of "Video Diary" for all to enjoy. Look for the videos on YouTube and on the front page of 4PlayerNetwork.com! Live Reactions / Commentary - While we currently have plans to attend several of the Showcase events such as Bethesda and Sony, several of us will be on hand to live commentate (on 4PP.tv or Twitch.tv/FourPlayerPodcast) the streamed event and react to all of the announcements with all of you at home! Please note that the EA conference actually takes place on Saturday, June 10th so we are likely to do a live commentary at that time. You can find the full E3 Press Conference schedule including dates, times, and time-zones above. We hope you will join us! Our Top 20 Games of E3 - The newest edition to our Content will actually come in the days following E3's conclusion. Upon returning from the trip, we will release a series of short videos highlighting our 20 favorite games from the event! This will give you a good idea of which games we are most excited to play and talk about in the coming year and hopefully garner excitement for another year of streaming and podcasting! Production begins as soon as we make it back to Austin. We will debut the videos on YouTube and possibly even a special screening on our Twitch channel. Well that just about sums it all up. We are very excited to be back in Los Angeles and look forward to sharing our excitement with you at home! You can help us out by being active on social media and helping to spread the word about our podcasts and videos all week long!